Where the land meets the sea, you'll find a challenging habitat filled with amazing creatures. The intertidal zone is the area between the highest tide marks and lowest tide marks. This habitat is covered with water at high tide and exposed to air at low tide. The land in this zone can be rocky, sandy, or covered in mudflats. Tides are "bulges" of water on the Earth caused by the gravitational pull of the moon and sun. As the moon rotates around the Earth, the bulge of water follows it. There is an opposite bulge on the other side of the earth. When the bulge happens in an area, it is called high tide, and the water is high. In between bulges, the water is low, and this is called low tide. In some locations (e.g., the Bay of Fundy), the water height between high tide and low tide may vary by as much as 50 feet. In other locations, the difference isn't as dramatic and may be just several inches. Lakes are impacted by the gravitational force of the moon and sun, but since they are so much smaller in comparison to the ocean, the tides even in large lakes aren't really noticeable. It is tides that make the intertidal zone such a dynamic habitat. The intertidal zone is divided into several zones, starting near dry land with the splash zone (supralittoral zone), an area that is usually dry, and moving down to the littoral zone, which is usually underwater. Within the intertidal zone, you’ll find tide pools, puddles left in the rocks as water recedes when the tide goes out.These are great areas to gently explore: you never know what you might find in a tide pool! The intertidal zone is home to a wide variety of organisms. Organisms in this zone have many adaptations that allow them to survive in this challenging, ever-changing environment. Moisture: There are usually two high tides and two low tides each day. Depending on the time of day, different areas of the intertidal zone may be wet or dry. Organisms in this habitat must be able to adapt if they are left “high and dry” when the tide goes out. Sea snails such as periwinkles have a trap door called an operculum that they can close when they are out of the water to keep moisture in. Waves: In some areas, waves hit the intertidal zone with force and marine animals and plants must be able to protect themselves. Kelp, a type of algae, has a root-like structure called a holdfast that it uses to attach to rocks or mussels, thus keeping it in place. Salinity: Depending on rainfall, the water in the intertidal zone may be more or less salty, and tide pool organisms must adapt to increases or decreases in salt throughout the day. 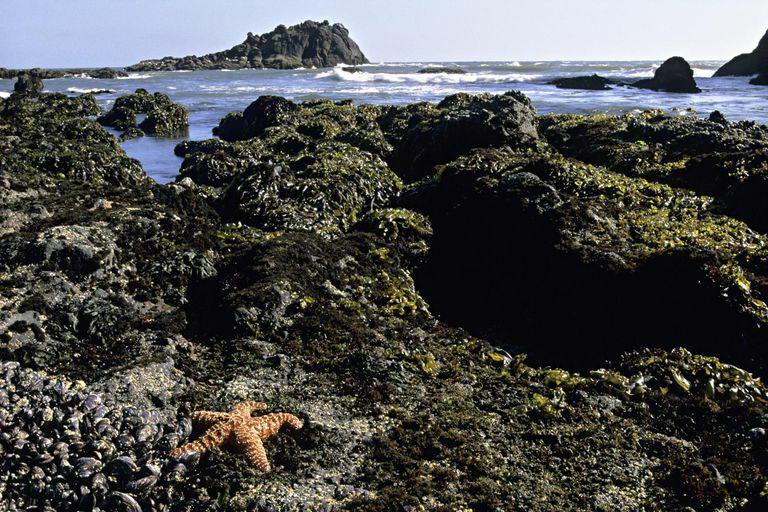 Temperature: As the tide goes out, tide pools and shallow areas in the intertidal become more vulnerable to temperature changes that could occur from increased sunlight or colder weather. Some tide pool animals hide under plants in the tide pool to find shelter from the sun. The intertidal zone is home to many species of animals and plants. Many of the animals are invertebrates (animals without a spine), which comprise a wide group of organisms. Some examples of invertebrates found in tide pools are crabs, urchins, sea stars, sea anemones, barnacles, snails, mussels , and limpets. The intertidal is also home to marine vertebrates, some of whom prey on intertidal animals. These predators include fish, gulls, and seals. Visitors: People are one of the biggest threats to the intertidal zone, as tide pools are popular attractions. 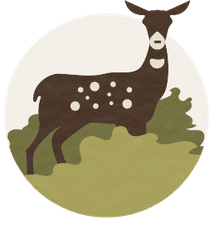 The cumulative impact of people exploring tide pools and stepping on organisms and their habitat, and sometimes taking creatures has resulted in a decrease in organisms in some areas. Coastal Development: Pollution and runoff from increased development can damage tide pools through the introduction of contaminants. Coulombe, D.A. The Seaside Naturalist. Simon & Schuster. 1984, New York. Denny, M.W. and S.D. Gaines. Encyclopedia of Tidepools and Rocky Shores. University of California Press. 2007, Berkeley. Tarbuck, E.J., Lutgens, F.K. and Tasa, D. Earth Science, Twelfth Edition. Pearson Prentice Hall. 2009, New Jersey.